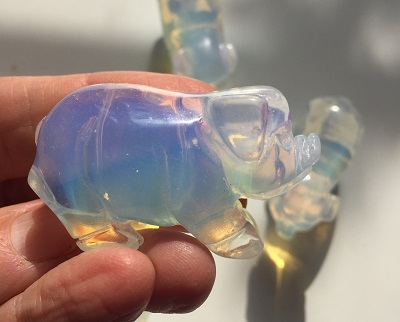 Translucent blueish-grey milky white colored Girasol quartz pig totem carving with pinkish internal flashes. Girasol Pig totem resonates with energetically going with the flow and supports one through transformation. Girasol Pig totem provides clarity of ideas, the release of fears, and the motivation to take a leap of faith to try something new. 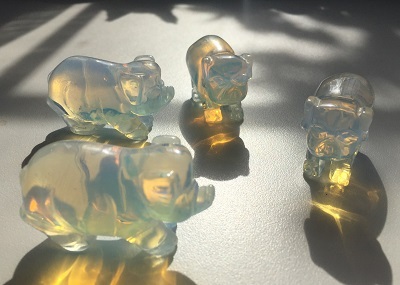 Girasol Pig totem may offer support to energetically change lazy behaviors, overcome procrastination, and give one an appreciative attitude and zest for living fully and with joy. 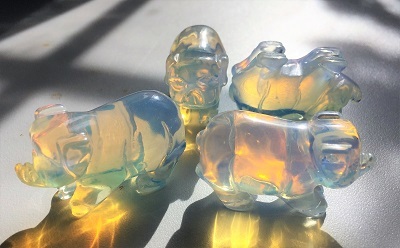 Girasol Pig totem is a wonderful crystal tool for detecting insincerity and lies, aura reading, telepathic information, and honing psychic skills of precognition. Girasol Pig totem teaches one to confront ideas of self-importance, to face your fears, and shred the false beliefs and lies that make up levels of deceit and insincerity. In healing, Girasol may be helpful in the treatment of tumors and growths, clearing out the mucoid system, and in supporting a healthy liver and the pancreas. 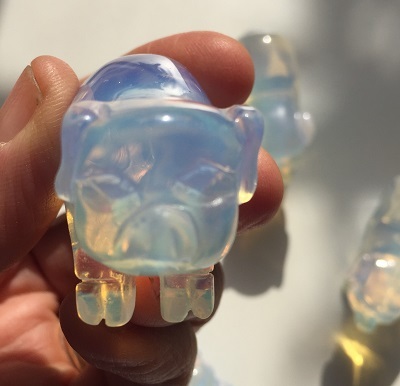 Pig totem may be helpful for those with skin issues and in maintaining body temperature.